I’d never heard of or noticed this place, but DebB mentioned Sub Zero in a blog comment recently. 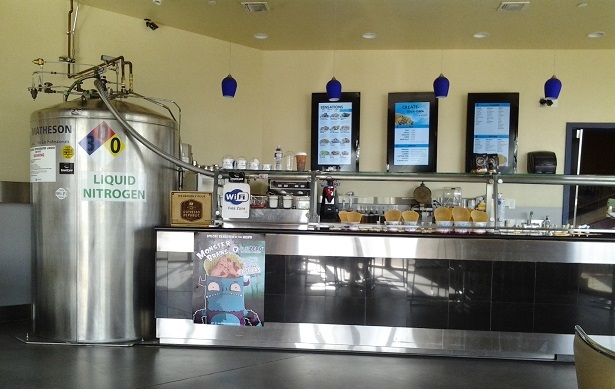 Sub Zero uses a similar liquid-nitrogen process as the new N7 Creamery at Victoria Gardens. Rancho Cucamonga is practically all-nitrogen, all-the-time. So I ate lunch at Panera at Haven and Foothill one recent afternoon and then drove north in search of Sub Zero, which is past where you’d think it would be, above the Town Center shops and behind the Mobil station in a small building with no other tenants. Inside it’s a clean, modern space. I was the only customer at the moment — a few more came before I left — and an employee explained the process. They make their own ice cream in front of you, mixing the flavors in a bowl and then quick-freezing it with nitrogen from a giant tank. 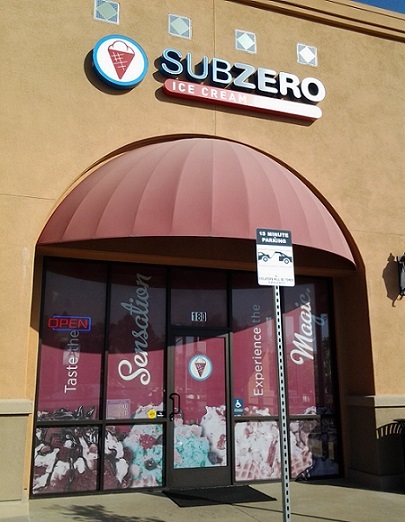 Sub Zero is coming up on its second anniversary in Rancho. The Utah-based chain is in seven states. Its founder has a chemistry background. 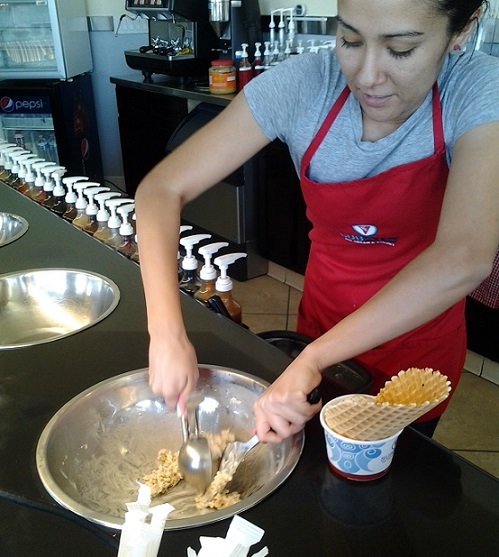 The menu has 55 flavors, plus mix-ins, or you can simplify things by ordering one of the combinations. Overwhelmed, I did so, getting the Bernoulli Brulee, with caramel, dulce de leche, vanilla and cinnamon flavor, Heath and Twix added. A small was $5.80 and came in a waffle bowl inside a cup. She mixed the cream and ingredients in a bowl, telling me the ice cream is creamier in their process because it doesn’t have air bubbles. The nitrogen blast had a dry ice effect as vapor swirled around the counter. Perfect for that Halloween spirit. Three scoops of ice cream was a lot for a small size. It tasted pretty good. Actually, I’m very happy with simply having someone hand-scoop my ice cream, and U look askance at Cold Stone and the whole mix-in trend, so I’m not sure I’ll ever go out of my way again to come here. (Although my receipt offers $1 off my next visit.) But the novelty was fun. 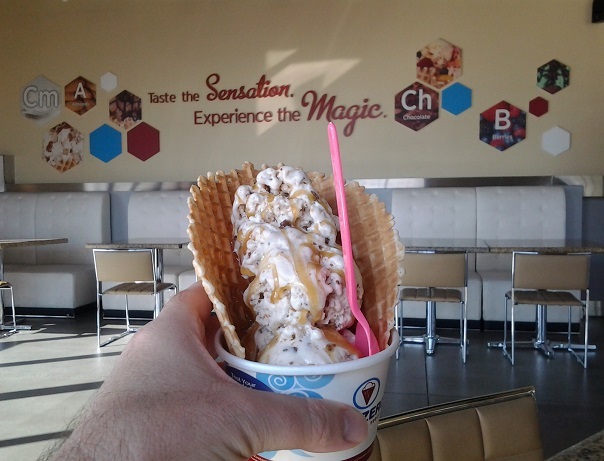 Now that I seem to be taking Rancho’s nitrogen ice cream parlors in chronological order, I’ll get to N7 sometime. This entry was posted in Restaurants: Rancho Cucamonga and tagged dessert, ice cream, Rancho Cucamonga, restaurants by David Allen. Bookmark the permalink. It IS fun as a novelty, isn’t it?! A little on the expensive side for me, and probably two or three days worth of Weight Watchers points, but definitely worth the occasional treat. Consider it entertainment, kind of like eating at Benihana! I don’t remember if I commented back when DebB first posted about this, but that same day I was in the Rancho area leaving heading home from Chaffey College, and I made it a point to stop into Sub Zero. (Had to load up DebB’s comment on my iPhone to figure out where the heck Sub Zero’s located). I forgot what I got… possibly just chocolate, I’m kind of boring that way… but I enjoyed it. If I lived a little closer, I’d stop by more often. I didn’t quite follow the server’s explanation of how the ice cream was being made, but, whatever, it was tasty. Hello there….Well thank you so much for this usefull post and I really found this post very usefull. I will definately bookmark this post and surely your blog to good . I just hope if I could get some more post like this.